The flooding caused over the weekend by a water supply pipe failure in the downtown of the Bulgarian Black Sea city of Varna has damaged parts of the newly uncovered Late Antiquity fortress wall of the Ancient Thracian, Greek, and Roman city of Odessos (Odessus). The flooding of the rescue excavations in the so called Varna Largo, a pedestrian zone in the downtown, has also resulted in the workers from the local water utility compromising the digs after entered the site without the permission of the local archaeologists and they cracked one of the recently found 5th century earthen jars lying in situ in the downtown with their earth mover. As the excavation site has been drained, on Monday, March 30, 2015, it has become clear that parts of the 5th century fortress wall has been damaged, and parts of it have collapsed, apparently, as a result of the flooding, reports local news site Varna Utre. The Late Antiquity wall has been a recent discovery of which the archaeologists from the Varna Museum of Archaeology have been especially proud given that ancient Odessos has several fortress walls from different time periods, and the location of this particular one had been unknown. “At least they didn’t manage to hit the fortress wall," lead archaeologist Prof. Dr. Valeri Yotov was quoted as commenting on Saturday but it now turns out that his hopes that the wall was intact have failed to materialize, and the Late Antiquity wall has been compromised. According to the report, the site of the rescue excavations is in a “deplorable" condition now that the water has been removed and all the damage done by the local water utility is clearly visible. It is still unclear whether the recently found skeletons have also been damaged by the flood or the earth mover of the water utility workers. 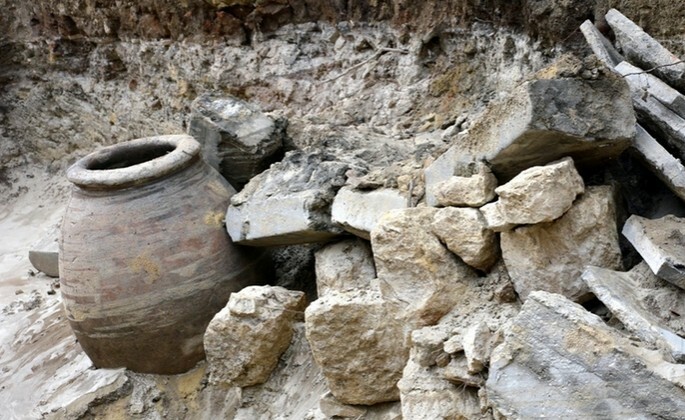 The rescue excavations in Bulgaria’s Varna started in March 2015 after an earthen jar (pithos) was found in January by construction workers rehabilitating the so called Varna Largo, a downtown pedestrian zone. During the rescue digs in March 2015 the archaeologists found a second earthen jar together with a stonemill and parts of the Late Antiquity fortress wall of Odessos. 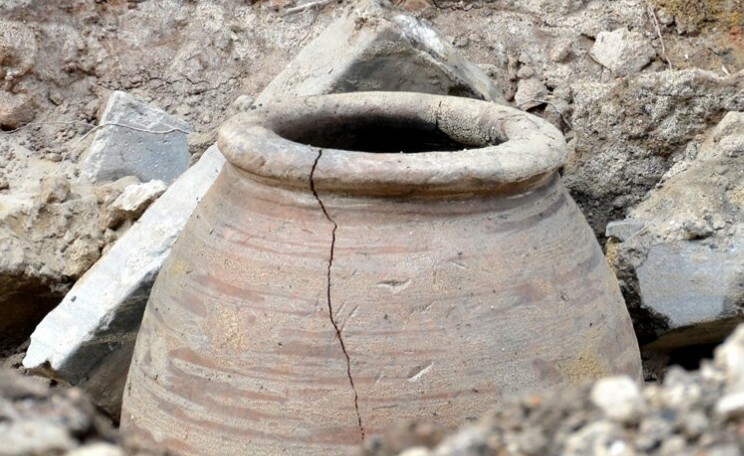 It is this second earthen jar that has now been cracked by an earth mover after employees of the local water utility entered the site of the ongoing archaeological excavations of ancient Odessos without the permission of the archaeologists. “The incessant water pipe failures and the arbitrary actions of the water utility are ruining the artifacts discovered during the recent excavations of the [Varna] Largo," Prof. Dr. Valentin Pletnyov, Director of the Varna Museum of Archaeology, complained on Saturday. Both Yotov and Pletnyov have said that the cracked pithos (earth jar) will be glued back together by museum specialists. The current rescue excavations of the Varna Largo will continue until April 1, 2015, and will be frozen for the duration of the summer tourist season. They are expected to be resumed in the fall of 2015.